Miami Beach in Florida is at the centre of sea-level rise and flooding issues. The large urban community experiences significant flooding every king tide. When facing the threat of increasing flood frequency, duration and height, the community is doing some things well, and others not so well. Miami Beach provides insights into how we will need to manage these issues in Australia. Like us, Miami Beach is looking to other locations for possible solutions. For example, New Orleans is creating a $100 billion plan to help secure the city and its coastal wetlands. The population of New Orleans has shrunk significantly in recent decades, complicating matters. Fewer people now bear the financial burden of maintaining infrastructure that once supported many more. Many think that problems can be solved through investment and engineering. For example, in the 1970s, after decades of continual flooding damage from the Kickapoo River, the army proposed to protect Soldiers Grove, Wisconsin, with a $3.5 million levee — more than three times the affected town’s asset value. The residents rejected the exercise, asking to be relocated instead. Relocation to higher ground nearby began in 1979 and was finished four years later. Because no blueprint exists for flood-proofing cities in Florida, where low-lying areas sit atop foundations of porous limestone, Miami Beach must develop its battle plan in real time. Miami Beach is starting to experience the dark side of risk transfer, where householders are asked to protect themselves and take care of their own property. Those in poorer communities often struggle to afford flood insurance prior to disasters or to rebuild their homes after them. The cost of insurance has been rising along with sea levels, which widens the gap between residents with a financial buffer and those at risk of losing it all. This has led to concern that instead of helping people to adapt, they are being stranded, both economically and socially. Notwithstanding these challenges, there are some innovative ideas being discussed. One example is to design new buildings with unusually high ceilings on the ground floor so that the floor can be raised when flooding becomes frequent. Another is the city’s commitment to develop a resilience strategy that calls for a new level of collaboration across City departments and jurisdictions, with private sector, not-for-profits and community organisations. They intend to break down existing barriers at the local level, account for pre-existing resilience plans, and create partnerships, alliances and financing mechanisms that will address the resilience vulnerabilities of all city residents, with a particular focus on low-income and vulnerable populations. 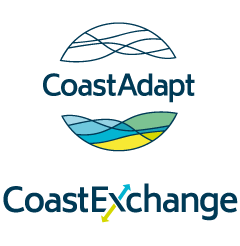 CoastAdapt provides the tools to do similar planning here in Australia. It encourages a range of adaptation actions, including policy, planning, soft and hard options that are all backed up with substantial and inclusive community and industry engagement. What is the attitude of your communities? Do they believe engineering will solve everything? Are we stranding poorer communities by not providing adequate incentives for collaboration, insurance and improvement?